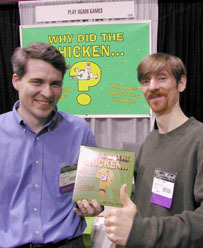 New Product: Why Did the Chicken...? GinohnNews: Hidden Trackable Information and Could Ye Pass the Russet Potatoes? Well, we're back from the GAMA Trade Show in Las Vegas, and as usual it was a smash. 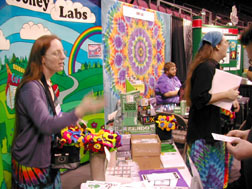 Here's a photo of our booth, but this time, it's kind of like a game of "Where's Waldo?" The exhibit hall this year was located on the covered-over floor of an ice hockey arena, which meant you could stroll around among the seats above to get groovy overhead views like this. "Check it out! I can see our booth from here!" We gave out lots of catalogs, along with most of the free product we brought with us, and we taught lots of people to play more of our games. Of course, we were showing off my latest Early American Chrononauts prototype, and everyone's very excited about it. We also got a lot of comments about & interest in our most recent release, Stoner Fluxx. We're very pleased to say that the overwhelming majority of reactions we got were very positive. Many stores have been selling it, and selling it well; some stores have been keeping it under the counter and still selling it well; some stores have decided not to carry it but still sell our other stuff and are still totally happy with us. One retailer I spoke with had gotten a couple of complaints but successfully used logic and printouts of essays from our website to change people's minds; and many retailers (and other manufacturers) came by to praise us for our bold and important stance. Woo-hoo! It's going well! Our next release won't be until Origins, but friends of ours were at GTS to officially debut their new game. 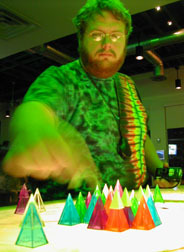 Our friend Jake and his wife Lisa have decided to jump into this crazy world of game publishing, and have formed a new company called Play Again Games. Their first release is Kory's excellent new party game, called "Why Did the Chicken...?" which arrived just in time for them to be giving away free copies to the retailers at GTS. Well done guys, and good luck! "Why Did the Chicken...?" is available for sale right now, here in the Looney Labs Random Emporium! 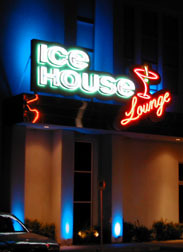 As usual, I left the convention casino a number of times, to explore other parts of Vegas during our stay, and while I was out and about, I discovered a wonderful place none of the guidebooks I read ever mentioned: The Icehouse Lounge! Well, with a name like that, it had to be good, right? When I first saw it, I stopped just to take a picture of the sign... but a quick glance inside revealed that the Icehouse Lounge was just the sort of cool, relaxed hangout I'd expect it to be. 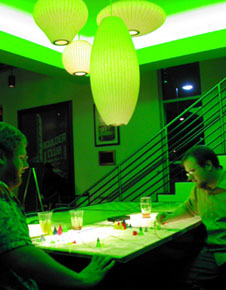 Among the many cool amenities the Icehouse Lounge offered was this excellent gaming table, covered with a wafer-thin sheet of polished marble and lit from underneath, effectively creating the perfect surface for Icehouse games: a light table. As usual, the appearance of an Icehouse game on a restaurant table always attracts attention, but you get a very different reaction from the waitress when you tell her that the name of the game is the same as the name of the lounge you're in. We wound up meeting the actual owners of the place, and I gave them a copy of The Empty City, after telling them their real-life establishment reminded me of the imaginary places I described in my book. Anyway, have an excellent week! "Assume for a moment that the statistics above are reasonably accurate and hold constant for a few years. Also assume the service on debt goes up a mere 14 of 1 percent per year. As the graph below shows, by the year 2011, 100% of the revenue the government receives will go straight from the taxpayer's pocketbook to the holders of US debt instruments. There will be no money for any governmental function in the United States of America whatsoever." -- Don Smith, "USA Out Of Business"